Greetings all! Today’s post is brought to us in collaboration with Quick Buyers. Enjoy! Divorce is always a contentious and sensitive issue, and one that causes a huge amount of emotional heartache. As a result of this, the divorce rate in the US and the UK is always a hot topic for discussion, with the number of permanent separations having increased slightly during the last five years. While an estimated 71% of these divorces were affiliated with first-time marriages, the national rate as a whole continues to fluctuate between 40% and 50%. Aside from the emotional distress that can be caused by divorce, there are also a number of practical factors that demand careful consideration from those involved. If you and your partner own one or multiple properties, these assets are likely to dominate your financial estate. It is therefore worth reaching an amicable agreement over their sale and distribution as soon as possible. If you own the house jointly (as most couples do), the best step is usually to sell the property quickly. Then you can split the proceeds equally between you and your partner. Specialist house sale businesses such as Quick Buyers can help you to execute an expeditious sale, so this is often a good first step. If your home is owned solely by your partner, you can still register your interest to make sure that it cannot be sold or mortgaged without your knowledge. This will also enable you to register the contributions that you made to the property’s up-keep and improve your chances of a favorable settlement. The next step is to focus on other shared assets, such as joint bank accounts, loans, and credit cards. In terms of bank and credit card accounts, you will need to communicate with your partner to determine whether you want to withdraw and distribute the remaining funds or freeze the account completely. In terms of joint loan applications, each partner is liable for the remaining debt. So you will need to arrange with the lender to alter the structure of the account so that you can contribute individually. The financial marketplace is littered with multiple products and services, and these also need to be factored in to your divorce. In the case of a contentious divorce, you may initially need to take out a court order that prevents your partner from transferring or selling shared assets to avoid a fair financial settlement. Even if your separation is likely to be amicable, it is important to list all joint and independently owned financial assets and include them into any future settlement. Attempting to hide any financial data or assets may harm your case, while you may face the threat of further court action if you are found to be deceitful. After your divorce is complete, you will want to take a good look at where you stand financially now. Do you make enough money alone to continue to live the lifestyle you had when you were married? If not, you will need to make some cuts! You may need to save more now than you did when you were a couple. And it will be a good idea to check on your credit after a divorce. Don’t skip this step! If any problems were caused by your ex-spouse, you will want to look into getting that cleared up as soon as possible. After a divorce, you will want to review your insurance policies and update beneficiaries if necessary. Similarly, you may need to update your will and/or trust after a divorce to reflect the change in your life. Have you been through a divorce? 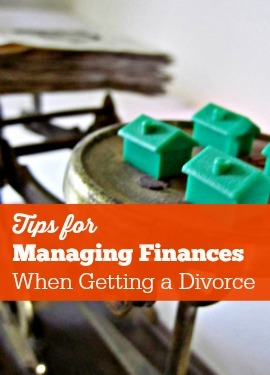 Are there any other tips that you would add to help in managing finances when getting a divorce? Great tips for mananging finance in a bad situation. Don’t get caught up in the hype of the moment focus on what can you control. Separating all the joint bank accounts and credit card account can help you protect yourself from a spouse who is unforgiving.